Sonoma State University’s Wine Business Institute School of Business and Economics pretty much says it all. While the University of California at Davis focuses on training enologists and viticulturalist, Sonoma State University (SSU) – being in the center of California’s North Bay wine world – was poised to go in this direction. SSU is the first U.S. institution of higher education to offer programs and degrees which specialize in the business of wine. It’s the first school of business in the world to offer an executive-level wine business degree. In 2018, WBI will open the Wine Spectator Learning Center, a 15,000-square-foot education complex dedicated to training the next generation of leaders for a changing global wine industry. Now, there is a Second Volume of Academic Case Research. These new case studies offer insights and lessons that have been learned from wine industry organizations in Italy, Germany, Spain, and the United States. This is an electronic journal dedicated to international wine business issues, and is published semiannually as an industry digest for qualified academics, scholars, students, and wine industry stakeholders. Case studies featured in the second volume offer an examination of issues related to the valuation of a California Central Coast family-owned winery; challenges of leadership transition and strategy change at a family-owned business in northern Italy; restructuring of sales channels and marketing strategy at a German winery; and brand equity planning across multiple wineries in Spain. The complete second volume is available here: https://wbcrj.scholasticahq.com/issue/604. The Wine Business Case Research Journal is published in an open-access format so that authors can retain copyrights to their work, and case studies are “double blind” reviewed so that authors and reviewers remain anonymous. Members of the Journal staff include Founding Editor and Korbel Professor, Dr. Armand Gilinsky; Associate Editor and Bordeaux-based international winemaking consultant, David Rowe; Production Coordinator and Sonoma MBA, Valery Vue; Consulting Librarian, Rita Premo; and Student Editor, Marguerite Williams. The publication’s founding editorial board includes five past editors of academic journals, wine business researchers, and university scholars from the U.S., France, Germany, Spain, Italy, Australia, Mexico, New Zealand, and South Africa. 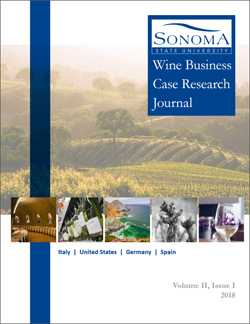 For more information regarding the Wine Business Case Research Journal, including sample case topics and submission guidelines, or to submit case research for the Spring/Summer 2018 edition, please contact wbizcase@sonoma.edu, or visit https://wbcrj.scholasticahq.com/. For information regarding wine business academic programs and degrees, please visit www.sonoma.edu/sbe, or contact (707) 664-3235 or winebiz@sonoma.edu.